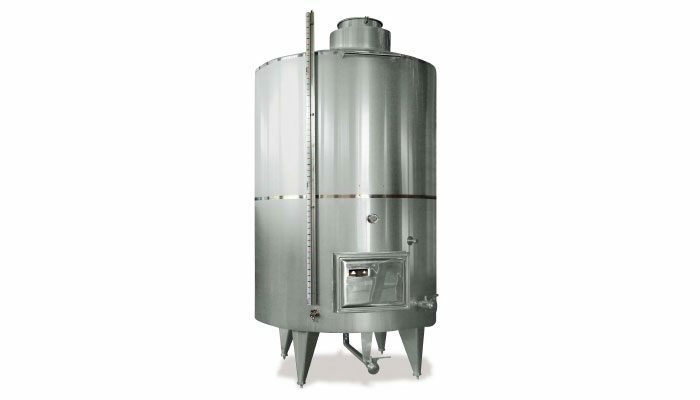 The C2 fully insulated multi-function tank can also be used for tartaric stabilization. The latter is employed as a wine preserving principle: stabilization and lowering of the degree of solubility of potassium bitartrate, which when crystallised is removed from the wine by filtering. The full insulation is able to considerably accelerate this practice, reaching temperatures of around -5° C by means of freeze plates with high heat exchange, specially proportioned and fitted to the tank, and to maintain the temperature with maximum reduction of tank heat dispersion. This is possible due to careful full insulation of the tank with polyurethane panels, clad on the outside with welded ASTM 304 stainless steel.